Leonardo is among the top ten global players in Aerospace, Defence and Security and has a significant industrial presence in Italy, the UK, the U.S. and Poland. Leonardo originally approached Red Box in 2015 looking for a trial unit for an undisclosed project they were working on. The unit supplied was selected in competition against similar units from other manufacturers as the choice for this project. Leonardo have since placed an order for 164 RBSC50 power units. RBSC50 is a compact, lightweight and highly portable power unit. Designed to give continuous high quality DC power at 28V and 14V. This model is ideal for diagnostic work, pre flight checks, charging on-board batteries or for providing continuous power to equipment during operations, without draining the aircraft’s on-board batteries. The RBSC50 has been used to power Leonardo’s LINAPS artillery pointing system. LINAPS is a self-contained gun mounted navigation, pointing and weapon management system for artillery and mortar platforms. 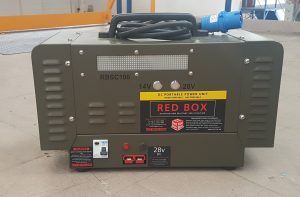 Red Box International are now in the process of manufacturing 7 of these power units per month. A total of 164 RBSC50 units will be produced. For information on how we can help you, contact our sales team on +1 (770) 962-6188 or email info@pricelessaviation.com.